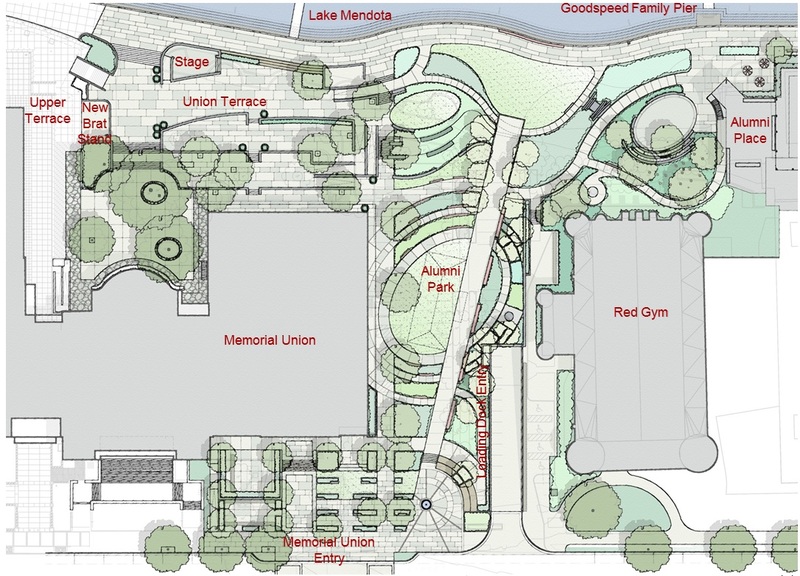 With Phase I of the Memorial Union Reinvestment (MUR) in full swing, tentative plans for Phase II of the project have recently been released by the design team, which include design concepts and floor renderings for spaces both inside and outside Memorial Union. These plans, which have yet to be fully approved by the MUR design committee, Union Council, the UW System Board of Regents, and the State Building Commission, are designed not only to restore the building’s aesthetics, but also to improve accessibility and preserve the historic spaces within the building. With the help of the same designers who worked on restaurants at Union South, the first floor will welcome two new eateries, one Asian-inspired and the other Italian-inspired.There will also be a combined kitchen for for all restaurants to improve efficiency and service. Peet’s Coffee & Tea will move to the southeast corner of the first floor and will overlook Library Mall, Langdon St., and the new Alumni Park, while The Daily Scoop will move to the east side of the building, welcoming guests who first enter from that side. At the main entrance will be a new Badger Market and a third dining experience called “Fresh Express,” where patrons can order fresh food made quickly. The area where guests order food at Der Rathskeller will also look and feel different. 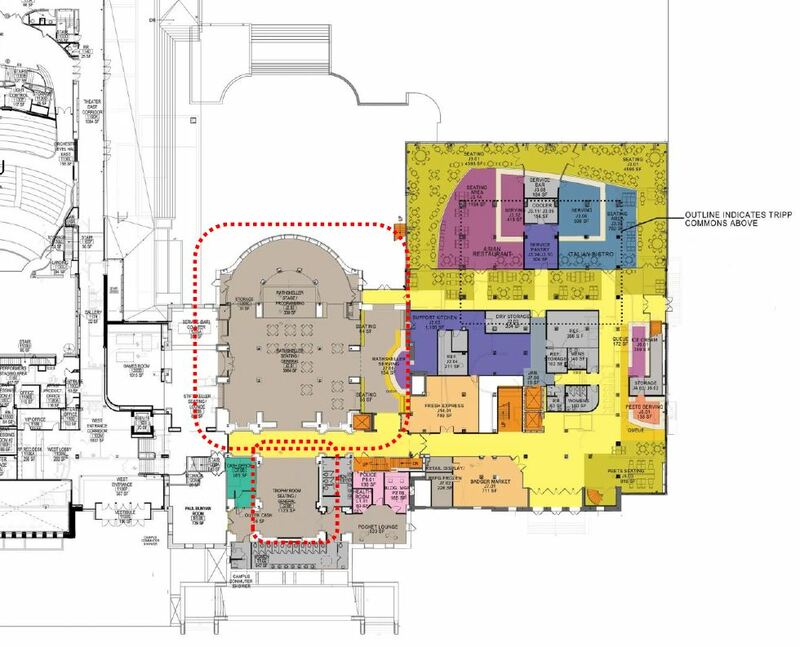 According to Mark Bennett, MUR project coordinator, there will be more space, with doors at the north end that lead directly to the Terrace, so patrons won’t have to navigate through people waiting in line for food or through furniture. The only two rooms that will remain virtually unchanged are Der Rathskeller and the Trophy Room. Apart from some much-needed restoration to elements like the light fixtures and the walls, these rooms will maintain their original feel and aesthetic. The east side of the second floor will transform into a second-story lounge for Peet’s Coffee & Tea, which guests can access via a spiral staircase on the first floor. Guests are invited to utilize the second floor lounge space as well as the outdoor deck stretching around the building on days with beautiful weather. While the Terrace will see a few upgrades (for example, a third level of seating), the historic characteristics that have made it an iconic landmark will be preserved. Lot 1 between Memorial Union and the Red Gym will undergo significant changes. The current above ground loading dock will move underground and will service all deliveries to and from Memorial Union, as well as the Red Gym and the Pyle Center. Moving the dock underground will make space to build a park that stretches from Langdon St. to Lake Mendota. 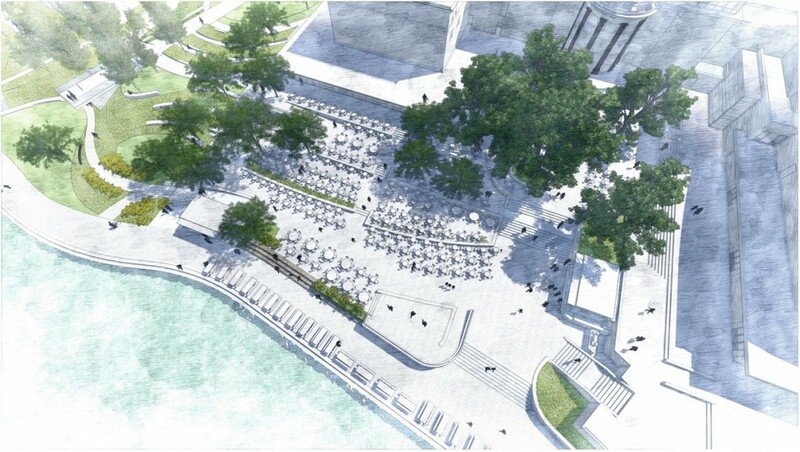 The campus park, which has been funded by the Wisconsin Alumni Association, will also extend to the glass windows of Memorial Union, allowing guests to walk straight from the park into the new interior spaces. The project team hopes to complete Phase I construction by fall 2014, with Phase II construction beginning that summer once approval has been received from all necessary parties. Visit the Memorial Union Reinvestment website to stay up to date on the project, view floor plans and renderings, and provide valuable feedback as renovations continue. Francesca Bonifacio is a UW-Madison senior majoring in Journalism–Strategic Communication and Communication Arts. Soon to be among the newest batch of grads (December 2013), she eagerly anticipates the completion of the Memorial Union Reinvestment and is excited to return to Madison to enjoy the fruit of intensive labor and dedication in the coming year.